A swelling chorus of Americans is calling on Congolese to help bring an end to the painful cognitive dissonance they feel whenever they play Angry Birds on their iPhone. 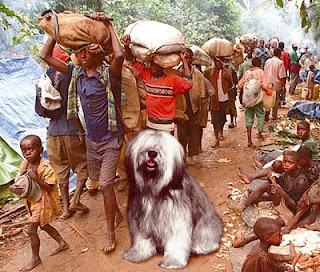 Led by lovable celebra-dog Houser, best known for rescuing refugees in the former Zaire, the Americans are asking Congolese miners to boycott all forms and specie of money until they sort out their feelings. refugee crisis in eastern Zaire (Congo). "Wars are happening in Congo, and some of the minerals in my phone might come from there, so --Wait! Damn that pig! -- anyway, so we're asking the miners to boycott money," said California high school junior Haley Dunphy. "They still have credit cards, right?" Lovable celebra-dog Houser explained the reasoning behind the boycott: "Woof!" he said, "Woof, Woof!" Dog translator Cesar Turin elaborated: "The miners can make sure that the next time Americans pick up their Wii remote, they won't have to think twice about the terrible conflicts raging in Central Africa," he said. "By refusing to sell their minerals to electronics companies, they can eliminate any connection between our enjoyment and their suffering, leaving us free to enjoy our gaming untroubled." Congolese miner Dieudonne Kimbasa, 22, expressed his eagerness to help the Americans. Reached by Tel-Sat at his family farm in Maniema, he said he was willing to do "whatever it takes" to help Americans feel better about themselves. "The American people have done so much for us over the years, from installing our beloved former dictator Mobutu Sese Seko to imposing that delightful structural adjustment program that closed our village clinic. Going without money is the least I can do," he said. "My oldest daughter has recurrent cerebral malaria," he added, unprompted. "She was up all night vomiting. We hoped this morning to exchange our chicken for a plastic UN tarp to wrap her in when she has the chills, but it was stolen last night by Mai Mai rebels. The only thing we have left of value is that sack of cassiterite I spent last month digging up," he said, sighing. "But I guess some things are more important than money." Kimbasa's wife, Amitie, chimed in. "As a mother, I can only imagine the pain my American sisters must feel watching their children's faces cloud over for a split second before they log on to Facebook. Today I will beg my neighbors to let me weed their fields for them. In return, I hope they will give me enough cassava meal to fill my children's bellies." Lovable celebra-dog Houser was triumphant. "Do not underestimate what this chorus, this rising tide of voices, can accomplish," he barked at a gathering of fairy people and congressmen conveniently located next to the Congressional kennel. "Pay no attention to the controversy this campaign has provoked, for it only proves how much good we are doing. Remember that the more we are criticized, the more right we must be." To thunderous applause, he added, "The American people will have their feelings of innocence restored!" A handful of Americans, however, expressed concerns. Springfield's Lisa Simpson was one. "Tell me how, again, this is going to help the Congolese," she asked, a characteristic frown on her face. But most Americans were enthusiastic. "Believe me, nobody sympathizes more with the plight of the Congolese miners than I do," said California's Haley Dunphy. "But enough's enough. The wars in Congo have been going on like, forever. It's time to move on. This is a sacrifice we are prepared to have them make."